THE BASIC SCHLOCK FILM BOOKSHELF, VOL. 6: The Grindhouse Influence – Schlockmania! Simply put, grindhouse fare has become a religion to an ever-growing cult of filmgoers who crave the illicit thrills of a more dangerous, less politically-correct era. Plenty of people have appointed themselves grindhouse experts to answer this call but only a select few walk the walk as skillfully as they talk the talk. The following trio of books highlight true experts in action, two of them dealing in multi-genre grindhouse fare and the third specializing in horror with a grindhouse flavor. All three titles are worthy of a schlock fan’s study and devotion. SLEAZOID EXPRESS by Bill Landis (2002 – Fireside): Simply put, this is one of the best books ever written on the subject of grindhouse culture. This is because Sleazoid Express was written by someone who was at ground zero during its heyday: Bill Landis spent a lot of time in the Times Square’s most notorious grindhouses during the 1970’s and 1980’s, including stints as a projectionist and a theater manager, and published the famous zine that gives this book its title. As a result, he is able to vividly recreate the setting and provide an invaluable insider’s perspective: Landis offers a ton of background material that will be news to even veteran grindhouse fans – the chapter on Mondo pioneers Jacopetti and Prosperi is a real eye-opener – and, despite some factual errors about the films themselves, his analyses of grindhouse fare are smart and impassioned. He also presents his material in a unique way, organizing his looks into various filmmakers and subgenres by starting each chapter with a “you are there”-styled exploration of a specific Times Square grindhouse where that material was popular. The sleazy, 42nd Street ambiance that Landis so skillfully evokes here makes this book a must read for anyone with even a passing interest in grindhouse fare. 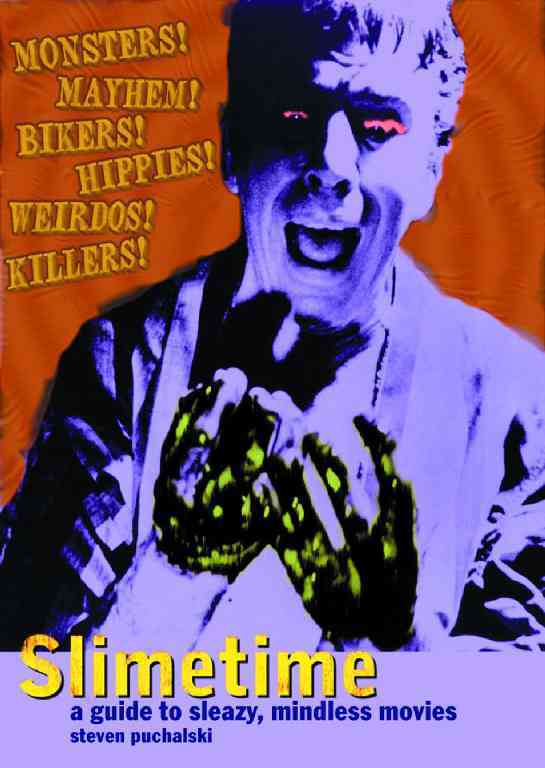 SLIMETIME by Steven Puchalski (1996 – Critical Vision): This is one of the newer influences on Your Humble Reviewer’s grindhouse tastes. I picked up this book after becoming a fan of Puchalski’s current zine, Shock Cinema. This tome gathers together a series of short reviews Puchalski and a few compatriots penned for his 80’s-era zine Slimetime. Like Puchalski’s current efforts, these reviews cover everything from grindhouse favorites to art-house obscurities and the writing style presents it all with a signature mix of enthusiasm, irreverence and sly insight into what defines good fringe filmmaking. This is a perfect style for dyed-in-the-wool schlock fans because it is savvy without being pretentious and has fun with the material – the ideal way to experience schlock. Slimetime also makes a good companion to the Psychotronic books because it offers a bit more detail and opinion in its reviews. The book is rounded out by a series of well-researched essays on biker, blaxploitation and drugs films, plus a bonus story about a Hunter S. Thompson appearance that Puchalski attended. In short, this is a vital addition to a schlock fan’s grindhouse-study repertoire. 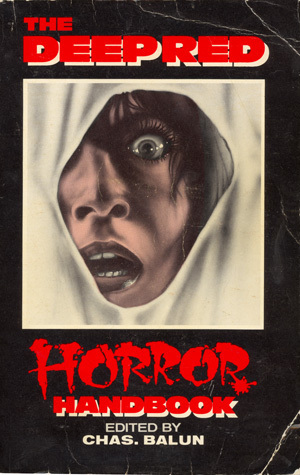 DEEP RED HORROR HANDBOOK Edited by Chas Balun (Fantaco – 1989): When Your Humble Reviewer was at the height of his teenage obsession with the horror genre, Chas Balun was his favorite writer on the subject and this book was his blood-stained bible. For those of you who aren’t familiar with the man’s work, Balun was the most opinionated and fearless rabble-rouser on the horror press scene of the 1980’s. Genre fans still debate his merits but as far as Yours Truly is concerned, his wit, passion and fearless love of diving into the genre’s darkest corners made up for any perceived lapses of taste or judgement. He’s the rare genre critic who can appreciate an acknowledged classic for all the right smartypants reasons AND outline all the joys of a schlocky experience with a fanboy’s crazed passion. Even if you totally disagree with his opinion on something, his “Lester Bangs of horror” writing style was entertaining enough to keep you reading. Deep Red Horror Handbook dishes up a series of fun, fan-minded essays penned by Balun and his compatriots from Deep Red magazine on various esoteric horror-fan topics: my personal favorites are a great article on taboo-trashing movies that “look you in the eye and spit” and Greg Goodsell’s witty overview of legendary brain-melting bizarre schlock epics like Black Devil Doll From Hell and Don’t Go Near The Park. Best of all, it also throws in an updated-for-1989 version of Balun’s Gore Score capsule horror review guide that lets you know where he stands on the horror flicks of the 1970’s and 1980’s. To enhance the rowdy, fan-friendly aspect of the book, each capsule comes attached with two ratings – a 1-to-4 skull rating that sums up the film’s artistic merits and 1-to-10 ‘splat’ count that outlines how much blood is spilled. How could a horror addict not love a book with this sort of approach? “Sleazoid Express” is an absolute classic. It may be controversial with some readers but I sure like it.